Over 600 ICI member foreign-invested enterprises operating in 74 countries met with Prime Minister Binali Yıldırım at the event held by the Istanbul Chamber of Industry (ICI). Hosted by ICI Chairman Erdal Bahçıvan, the meeting, exploring the theme of “Trust in Turkey, Produce in Turkey”, was attended by Mr. Mehmet Şimşek, Deputy Prime Minister, Mr. Bülent Tüfenkci, Minister of Customs and Trade, Mr. Nihat Zeybekci, Minister of Economy, and Mr. Faruk Özlü, Minister of Science, Industry and Technology. 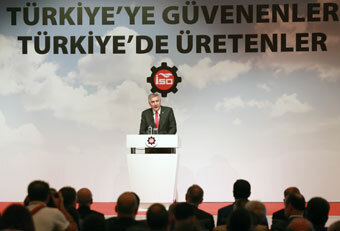 ICI Sectoral Committee Members participated in the meeting that gathered over 600 foreign-invested ICI member enterprises from a variety of sectors such as food, automotive, chemistry, and machinery, which have been operating in Turkey for long years and contributing to the country’s economic development via production and creating employment. Speaking at the meeting, Hüseyin Gelis, CEO and President of Siemens Turkey; Gökhan Saraç, Executive Vice President, General Counsel and Board Member for Unilever Turkey, Russia, MENA, Central Asia and Caucasus; Ahmet Erdem, Shell Turkey Country Chairman; Ali Koç, Chairman of Ford Otosan; Mahmut Sarıoğlu, Deputy President of The Good Year Tire & Rubber Company; Sami Sevinç, Executive Director of ABB Turkey; Buğra Kavuncu, CEO of BASF Türk; Dr. Altan Demirdere, Head of Sandoz / Novartis Turkey and Middle East; Tankut Turnaoğlu, Chairman of Procter & Gamble Turkey / Caucasus; and Zeynep Sungu, Marketing Services and Corporate Communications Director at Nestle Turkey expressed their trust in Turkey and noted that they would continue investing, producing, creating jobs and exporting in Turkey. PM Binali Yıldırım, attended the meeting via teleconference as he was in Ankara for a series of official visits. During his speech that was broadcast live across Turkey, Yıldırım thanked Erdal Bahçıvan, Chairman of the Istanbul Chamber of Industry. Addressing the business world, “Our democracy and economy remain strong as ever,” he said. PM Binalı Yıldırım continued as follows: “You have made a quite exhaustive assessment in the meeting. You have had the opportunity to address current issues as well as Turkey's vision on the future of industry and economy. 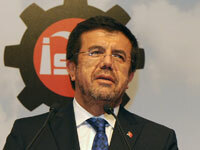 Industry is Turkey's driving force. You are creating employment and adding value to our country. You deserve all the support you receive. Industry is a grueling line of work. You have to love this calling to pursue it, especially under today’s increasingly challenging conditions for manufacturing. But once you complete the work and see the results with your own eyes, you forget about all the hardships you went through. I consider industry as one of the leading sectors that will pave the way for our goals for 2023. Meanwhile, we cannot afford to lag behind in the transition to Industry 4.0. In order to attain our 2023 goals, we must combine the tenets of the Industrial Revolution with informatics and technology. We cannot keep living under the shadow of this coup. Indeed, we have ambitious goals for the future. 2023 is just around the corner. We do not have a day to spare. The way to preserving the achievements of economy lie on protecting the values of democracy. This is why those who attacked Turkey’s democracy may be considered to have actually targeted Turkey's bread and butter. The putschists failed to shake the roots of our economy. Our democracy and economy remain strong as ever. 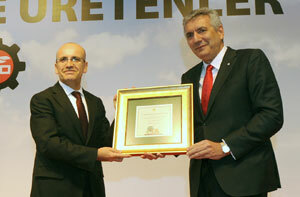 We are taking the steps towards enhancing Turkey's investment environment. On his keynote speech, ICI Chairman Erdal Bahçıvan reminded that ICI was on the side of democracy without, the will of the nation and the elected government since the very first hours of the July 15 coup attempt by FETO, also known as the Parallel State Organization. 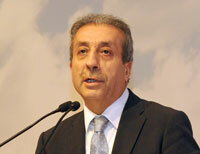 Bahçıvan noted that, as a prominent business organization, they condemned the coup attempt as soon as they heard about it through joint declarations, active participation in the "Martyrs and Democracy Rally" held at Yenikapı, and a letter sent by ICI members to more than 18 thousand stakeholders abroad. Noting that as a continuation of these efforts, ICI had brought together PM Yıldırım and Ministers with well-established, foreign-invested ICI members each of whom have made a name for itself in its respective field, and have been contributing to Turkey’s economy for many years, Bahçıvan added: “Your presence in this meeting hall is a testament to your trust in the future of Turkey as investors who, for long years, have placed their trust in Turkey and produced in Turkey. What we have here today is the story of those who trust in Turkey and produce in Turkey. This is the story of all of us who work collectively, cooperatively and amicably to spin the wheel of production. Eighteen thousand national and foreign capital ICI members have focused their individual and collective efforts to contribute to the development of our country by sharing their knowledge, experience and vision, and creating synergy. “Our economy may be facing some structural problems, but in general, it has robust roots. If it were not for these strong roots, Turkey would have a much harder time leaving these difficult times behind and financial markets would be in worse conditions. We had a structural reform on the agenda. We managed to return to this agenda topic in a short while. To create added value, we need to make R&D and develop an ecosystem. For this, we prepared a stimulus package. We are restructuring the Development Bank. The patent law is submitted to the parliament. We hope to pass this fundamental law, as well, with the opposition. Many steps have been taken on the R&D. Now, it is time to turn it into a business. The draft code of experts has been presented to the parliament, and the Istanbul Arbitration Centre has been founded. “We hope to sustain our efforts for reform that we initiated before the coup attempt. There are two key points regulating the business and environment: the economy, and democracy. It is clear that the upcoming period will see a better and faster process in terms of economy and democracy. Today, Turkey is one of the world's key production bases. We are willing to make Turkey a center of high-tech as well. We can increase our income only as much as we can developm in these areas.